The city of Pietermaritzburg is the capital city of the Province of Kwazulu-Natal. Over the past few years the cities local economy has been in decline and many workers have lost their jobs through factory closures. Poverty is generally on the increase. A progressive local religious organisation is calling a public meeting to talk to these challenges. It has called on community organisations, charities, activists, and interested citizens to attend. The main speaker for the event will be the Executive Director of COPAC, Vishwas Satgar, who will share insights from COPAC’s current research focusing on successful cooperative experiences from Africa. 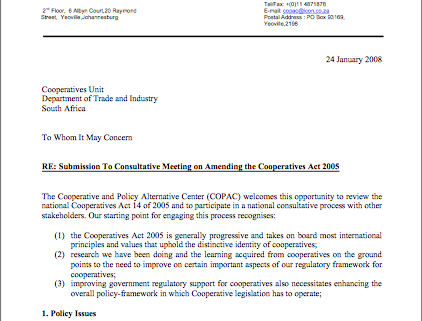 (3) improving government regulatory support for cooperatives also necessitates enhancing the overall policy-framework in which Cooperative legislation has to operate. From the 8th to 10th June 2006, at Devonshire Hotel, Johannesburg, the Co-operative and PolicyAlternative Center (COPAC) in partnership with the Rosa Luxemburg Foundation co-hosted an international conference. This conference was entitled: Co-operative Alternatives to Capitalist Globalisation – Building Human Solidarity to Sustain Life. The conference was motivated and informed by various considerations. A need to share international experiences of people centred co-operative movements and initiatives and how they have engaged with the current wave of globalising capitalism and neo-liberal policy prescriptions. We hoped to use the conference platform to participate in an ongoing dialogue and search on the African continent for alternatives to capitalist globalisation through the Africa Social Forum process especially the more recent Bamako Appeal. We invited many international guests – from Brazil, Ireland, Germany, Mauritius, India, China, Jordan and international co-operative movement organisations like CICOPA – to participate in the dialogue. We also invited a cross section of South African organisations involved in the co-operative movement and sector, including government at various levels. This document captures a record of the conference. It includes the problem statement, written inputs submitted by international and national guests, an overview of outcomes and a contact list for all attendees to the conference. We are hoping the latter document would be utilised to continue the networking and solidarity building work begun at the conference.